Heat and air conditioning losses in buildings and factories lead to a large amount of wasted energy. To prevent such losses, a precise digital model of heat distribution and heat flow is needed. Imagine a technology that enables one to gage the environmental structure in three dimensions and thermal information at the same time. Further imagine clever visualization software that presents the thermal 3D models to a computer screen, lets the user rotate the model for inspection and runs simulations of heat and air flow. The project ThermalMapper aims at constructing precise thermal 3D models of indoor environments. Technology that has been developed in the last years by robotic researchers is now available to be adapted to solve these real world issues. "The Action Plan for Energy Efficiency estimates that the largest cost-effective energy savings potential lies in the residential (around 27%) and commercial buildings (around 30%)". The availability of precise thermal 3D models will enable architects and construction engineers to modify existing buildings to reach these savings. The central point of the project ThermalMapper is to create 3D models that include thermal information as additional modality. In the course of the project ThermalMapper, 3D mapping methods will be enriched with thermal information, visualizations and simulations are developed to continuously gather and present data on what is taking place inside a building. Applications range from thermal 3D modelling of houses to factories. For example, service providers such as data processing centres are highly interested in constant and concurrent data acquisition techniques to optimize load control while providing high availability. Since thermal issues are very important for operators of data centres, we have chosen this scenario for additional demonstrations. This video explains briefly our propsed approach. More videos can be found on this youtube channel. This video presents an animation of a 3D point cloud with thermal information. More videos can be found at the youtube channel of the Automation Group at Jacobs University Bremen. ThermalMapper is a SEE-ERA.NET project and has the project number ERA 14/01. SEE-ERA.NET PLUS has launched a joint call for European Research projects in September 2009 in order to enhance the integration of the Western Balkan Countries into the European Research Area. The following image shows the robot Irma3D equipped with a Reigl VZ-400 laser scanner and an Optris Imager PI thermal camera. Girum Demisse, Dorit Borrmann, and Andreas Nüchter. Interpreting Thermal 3D Models of Indoor Environments for Energy Efficiency. In Journal of Intelligent and Robotic Systems, Springer, ISSN 0921-0296, 2014. Dorit Borrmann, Andreas Nüchter, Marija Dakulovic, Ivan Maurovic, Ivan Petrovic, Dinko Osmankovic, and Jasmin Velagic. 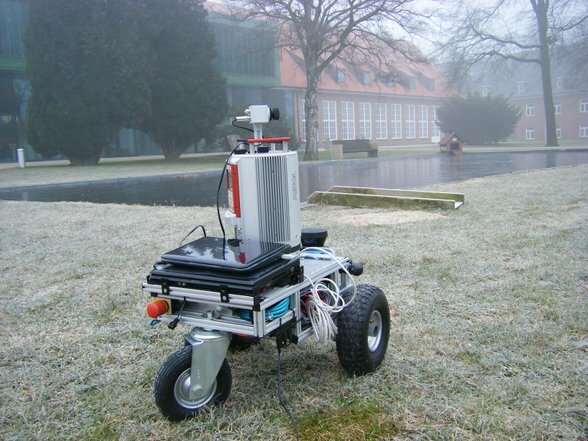 A mobile robot based system for fully automated thermal 3D mapping. In Advanced Engineering Informatics, Elsevier, ISSN 1474-0346, 2014. Girum G. Demisse, Dorit Borrmann, and Andreas Nüchter. Interpreting Thermal 3D Models of Indoor Environments for Energy Efficiency, Proceedings of the 16th IEEE International Conference on Advanced Robotics (ICAR '13), Montevideo, Uruguay, November 2013. [Get Paper]. Dorit Borrmann, HamidReza Houshiar, Jan Elseberg, and Andreas Nüchter. Vom Kombinieren von 3D-Modellen mit Farb- und Temperaturinformationen. in Photogrammetrie Laserscanning Optische 3D-Messtechnik, Beiträge der Oldenburger 3D-Tage 2013, pp. 246-253, Jade Hochschule, Wichmann Verlag, ISBN 978-3-87907-528-7, February 2013. Dorit Borrmann, Hassan Afzal, Jan Elseberg, Andreas Nüchter. Video: Thermal 3D Modeling of Indoor Environments for Saving Energy, In Proceedings of the IEEE/RSJ International Conference on Intelligent Robots and Systems (IROS '12), ISBN 978-1-4673-1735-1, pages 4538 - 4539, Vilamoura/Algarve, Portugal, October 2012, [Get Paper]. Dorit Borrmann, Andreas Nüchter, Marija Dakulovic, Ivan Maurovic, Ivan Petrovic, Dinko Osmankovic, and Jasmin Velagic. The Project ThermalMapper – Thermal 3D Mapping of Indoor Environments for Saving Energy. In Proceedings of the 10th International IFAC Symposium on Robot Control (SYROCO '12), Volume 10, Part 1, ISBN 978-3-902823-11-3, DOI 10.3182/20120905-3-HR-2030.00045, Dubrovnik, Croatia, September 2012, [Get Paper (PDF)]. Dorit Borrmann, Hassan Afzal, Jan Elseberg, and Andreas Nüchter. Mutual Calibration for 3D Thermal Mapping. In Proceedings of the 10th International IFAC Symposium on Robot Control (SYROCO '12), Volume 10, Part 1, ISBN 978-3-902823-11-3, DOI 10.3182/20120905-3-HR-2030.00073, Dubrovnik, Croatia, September 2012, [Get Paper (PDF)]. Dinko Osmankovic and Jasmin Velagic. Increasing the Precision of Reconstructed 3D Model of Indoor Robot Environment by Elimination of Problematic Points. In Proceedings of the 10th International IFAC Symposium on Robot Control (SYROCO '12), Volume 10, Part 1, ISBN 978-3-902823-11-3, DOI 10.3182/20120905-3-HR-2030.00121, Dubrovnik, Croatia, September 2012, [Get Paper (PDF)]. Dinko Osmankovic and Jasmin Velagic. Reconstructing the 3D thermal model of indoor environment from unorganized data set acquired by 3D laser scans and thermal imaging camera. In Proceedings of the IEEE Multi-Conference on Systems and Control (MSC '12), IEEE Explore, Dubrovnik, Croatia, October 2012, [Get Paper (PDF)]. Dorit Borrmann, Jan Elseberg, and Andreas Nüchter. Thermal 3D Mapping of Building Façades. In Proceedings of the 12th Conference on Intelligent Autonomous Systems (IAS '12), ISBN 978-3-642-33931-8, Jeju Island, Korea, June 2012, [Get Paper (PDF)]. Dinko Osmankovic and Jasmin Velagic, Modified histogramic technique for mobile robot indoor environment mapping based on uniform random distribution. In Proceedings of the IEEE Workshop on Advanced Motion Control (AMC '12), IEEE Xplore, ISBN 978-1-4577-1071-1, Sarajevo, Bosnia and Herzegovina, March 2012, [Get Paper (PDF)]. Flavia Grosan, Alexandru Tandrau, and Andreas Nüchter, Localizing Google SketchUp Models in Outdoor 3D Scans. In Proceedings of the XXIII International Symposium on Information, Communication and Automation Technologies (ICAT '11), IEEE Xplore, ISBN 978-1-4577-0746-9, Sarajevo, Bosnia, October 2011, [Get Paper (PDF)]. Jan Elseberg, Dorit Borrmann, and Andreas Nüchter, Full Wave Analysis in 3D Laser Scans for Vegetation Detection in Urban Environments. In Proceedings of the XXIII International Symposium on Information, Communication and Automation Technologies (ICAT '11), IEEE Xplore, ISBN 978-1-4577-0746-9, Sarajevo, Bosnia, October 2011, [Get Paper (PDF)]. Jan Elseberg, Dorit Borrmann, and Andreas Nüchter Efficient Processing of Large 3D Point Clouds. In Proceedings of the XXIII International Symposium on Information, Communication and Automation Technologies (ICAT '11), IEEE Xplore, ISBN 978-1-4577-0746-9, Sarajevo, Bosnia, October 2011, [Get Paper (PDF)]. Marija Dakulovi&cacute;, &Sacute;andor Ile&sacute;, Ivan Petrovi&cacute; Exploration and Mapping of Unknown Polygonal Environments Based on Uncertain Range Data, Automatika, 52(2), pp. 118-131, 2011. [Get Paper (PDF)]. Please look at the 3D scan repository. Please refer to the slam6D open source project or to github for deliverable D4.1 or to this link for deliverable D5.1.